Every year I am so grateful for the SC Knitting Guild's annual knitting weekend. I get to see old friends, I get to make new ones, I get to TEACH! Plus there is knitting, wine, and fun. This year I taught my Sandy Scarf, named for my friend Sandy at last year's Knit Inn (Her: "What are you calling that new design you're working on?" Me: "I don't have a name yet." Her: "You should name it after me." [laughs] Me: "Ok I will!"). It's a fun pattern to teach and I'm glad to be able to honor Sandy with a pattern, since if it weren't for her, I might never have sold The Reversible Cable Wrap or the Carousel Hat to Red Heart. Y'all need friends like that your life, trust me! Huge shout out to all the hard-working organizers who put this event on every year. I know it's hot, and where I am, it's so muggy you tend to feel like you've been hit by a warm wet cotton bath towel, right in the face, when leaving an air conditioned building and walking outside. A lot of people stop knitting during the Summer and I get that. It's hard to keep anything going when you just want to sit under the ceiling fan and drink iced tea. However, since I think it's worth doing, here are my Top 10 Reasons to Keep Knitting This Summer. 10. You're no quitter. Seriously, think about it. You made it through school, you have held down boring jobs, you've hit redial repeatedly for an hour to win concert tickets. You're no quitter--so don't quit knitting. 9. Knitting will help with Summer travel. Stuck in an airport? Facing a long car ride? Take your knitting. 8. Keep up your proficiency. This is especially key if you're a relatively new knitter. Your hands gain the muscle memory for knitting by practice and if you take the summer off, you'll get flabby. Your muscle memory will get flabby, that is. 7. Get a jump start on holiday gifts. Don't be like me and wait until November to realize you want to knit big gifts for your immediate family and not only have you not cast on, you don't even have the yarn yet. Pick a holiday gift to work on for each of the draining, mind-melting Summer months. 6. Knitting is fun. Just thought I'd remind you of that, in case you'd forgotten. 5. Learn new techniques. Pick a new technique you've always wanted to learn and make it a summer project. I know several knitters who wanted to train themselves to knit Continental instead of English so they made it a project to master it. Summer is a great time for that. 4. Knitting will help with uncomfortable visits. Have guests coming? Having to go visit someone else? Not entirely comfortable with these individuals? (hey, it happens) Pull out your knitting and give yourself something to focus on that is positive and soothing. 3. Knit for those in need. Don't wait until the weather turns cold to start knitting warm hats for the homeless. Or until the Red Scarf Project deadline to cast on a scarf for foster kids heading off to college. 2. Beat the heat with an indoor activity. Yes, knitting is highly portable and you can take it with you to the park and the beach and all, but if you're in the middle of a heat wave with honest-to-goodness heat advisories being issued, you do not want to be outside. Also, drink lots of water. 1. Being a knitter is worth it. Even though it's hot and you're busy and the humidity makes your head hurt and you feel sluggish, it's worth it to pick up those needles. Being a knitter is what helps us stay sane and grounded and calm and engaged during the rest of the year. It connects us to our ancestors, to our community and to people on the other side of the world. Being a knitter has given us a reason to get out of bed in the morning when times are hard. It keeps our brains young, our hands limber and our creative juices flowing, no matter our chronological age. Knitting isn't just something we do in our spare time, when the weather suits us. We are knitters. So keep on knitting, despite the heat. Stay hydrated, stay focused and we'll make it to Fall, I promise. It's only 14 more Saturdays, remember? For several years now I've been making the trek to Greenville, SC to attend the SC Knitting Guild's Knit Inn, and it's always a blast. 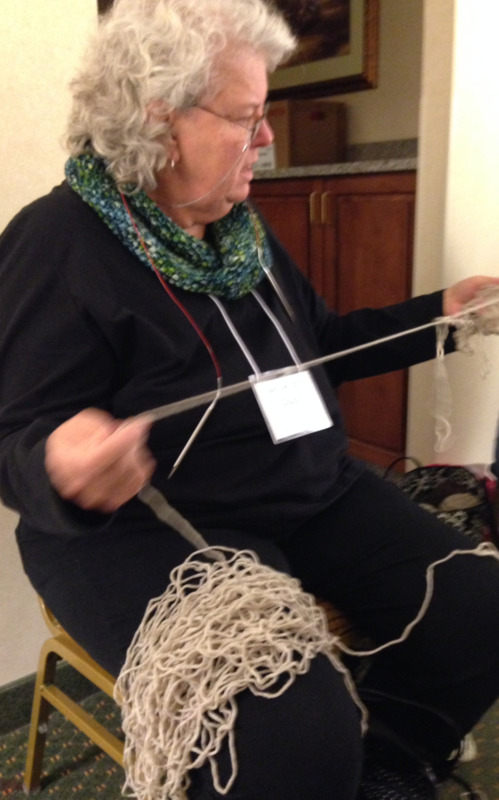 As you can imagine, with 250 knitters over the weekend, there were a lot of tangles. I was treated to two completed Winter Shawl versions, which made me enormously happy. Charleston Scarf class and their great swatches! I took a couple of classes, including one on I-cords tips and techniques that was amazing. I also ate too much, knitted some, ripped out some more, and talked a LOT. I got to see Sandy Huff, which is always a treat. And when I admired Gerri and Carol's amazing bags, I was told they made those in one of her classes. So much awesomeness. She's really not that short! Gerri (l) holds the distinction of being in all the classes I was in this weekend. I told her I am now spoiled and it will never be the same without her and we should plan accordingly next year. Carol (r) and I were only in one class together, but it's always fun when she's around. I missed getting pics of a lot of people, including my friends Dianne (who introduced me to someone like this: "I admired her shawl one year and we've been friends ever since!" I love it.) Pat, Teri and Becky (whom I've known since high school, before I was a knitter!). Also, Tom, who freely shared some amazing tips with me for future blog posts, Krista, my new friend from Yarn and Y'all in the 'ville, Starr, who took a class from me and has been so sweet and encouraging to me ever since...and a cast of thousands, give or take a few. I'll leave you with this--two of my biggest cheerleaders, Flo and Michele. They befriended me at a Knit Inn years ago (before I knew everybody) and have kept up with my exploits during the year between Knit Inns ever since. They're both like favorite aunts that you can talk to about anything. Overall, it was wonderful, as always! Knit Inn weekend always leaves me tired but inspired and so very grateful to know so many lovely talented people.